A rare find for any Baseball Memorabilia Collector; or just to be used, as a water bottle! 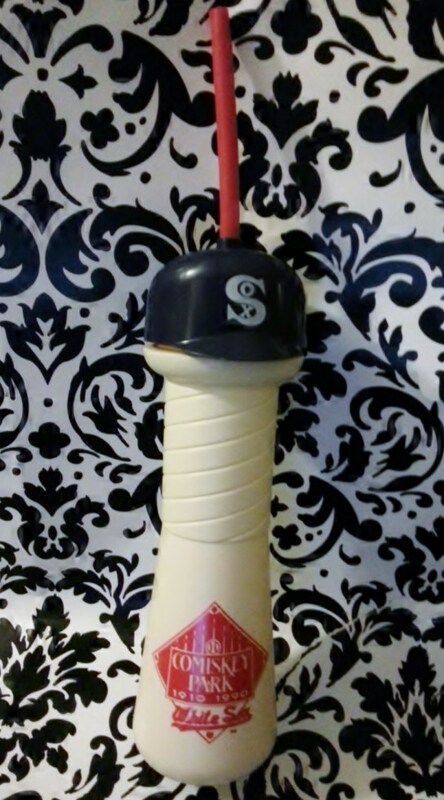 McDonald's Water Bottle - White Sox ... Comiskey Park 1910 - 1990. An awesome rare find for any Baseball Memorabilia Collector; or just to be used, as a water bottle! McDonald's Water Bottle - White Sox ... Comiskey Park 1910 - 1990! Lightly used, and vintage. The White Sox cap is only for decorative purposes. A red screw-on cap is underneath it. The bottle, without the straw, stands about 10 and a half inches; the straw is a hard plastic (washable), and is about 15 inches, in length. The words, 'American Beverage Container' is engraved, into the plastic, at bottom of the bottle (please, see photo 4). This is an 'As Is' sale. This water bottle show a little use - also, there is a small mark on back of bottle; and the water bottle is being sold as is (please, see photos). However, the water bottle is in excellent condition, for it's age (again, see photos). Copyright 1990 (an estimated guess), was sold by McDonald's.